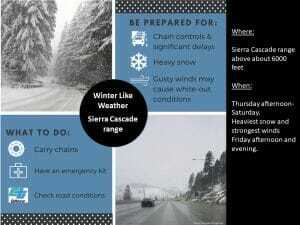 April 3, 2019 – Unsettled weather the rest of this week as several weather systems impact Northern California. A system moving through Thursday night and Friday will have the greatest impacts with periods of heavy precipitation, gusty winds, and lower snow levels for mountain travel impacts. Unsettled weather will continue early next week but with lighter precipitation amounts. Fairly flat upper ridge of high pressure over the eastern Pacific slipping inland this morning and as a result, showers that formed over Butte county Tuesday evening are shifting northward and weakening. This upper ridge will slide across the CWA today but can not rule out a threat of showers as shortwaves ride across the top of it through the Pacific Northwest. Any shower activity today will remain on the light side and mainly over mountains north of interstate 80. Weak upper ridge moves quickly inland allowing next Pacific low pressure system to approach the coast on Thursday. First impulse to rotate out of this low will bring relatively light precipitation to most of the forecast area Thursday and Thursday night. 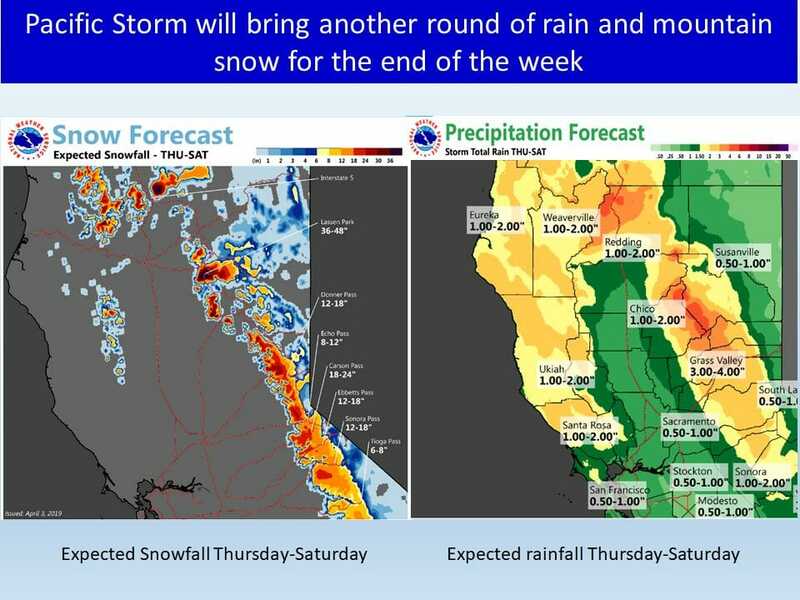 A stronger and wetter disturbance will pivot across Northern California on Friday. Snow levels with this system remain below pass levels so travel impacts are likely. 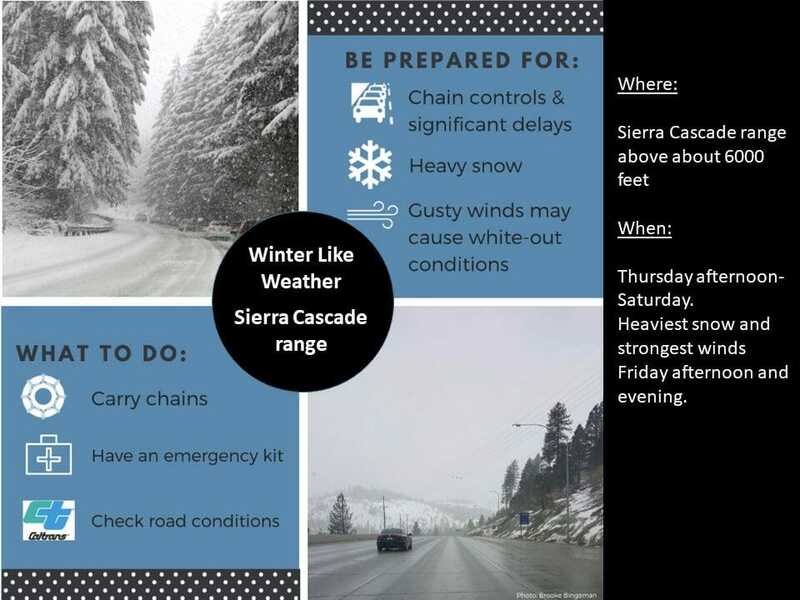 Heavy snow combined with moderately strong wind will bring dangerous travel conditions over the Sierra and through the Cascades early this weekend. At the lower elevations, general QPF values look fairly moderate but enough instability will be generated for a threat of thunderstorms over parts of the Sacramento valley and foothills. Therefore, localized flooding will be possible but general area flooding is not expected. Windspeeds associated with this frontal disturbance look like they could top wind advisory criteria over parts of the Sacramento valley and foothills Thursday night and early Friday as the front passes through. Flat ridging returns to the west coast on Saturday but models very indecisive as to haw far southward to bring the precipitation chances. Have left chance pops in for entire CWA Saturday but if GFS solution, which has a stronger ridge, develops, then much of the forecast area would see a dry day on Saturday. Models suggest some overrunning precip across northern portions of the CWA Sunday into Monday but differ with southern extent of it. Ensemble solutions suggest bulk of mostly light precip will be north of I-80 during this period. Relatively weak short wave trough progged through Tuesday with light QPF depicted, mainly over the foothills and mountains. Upper level ridging builds inland over interior NorCal Wednesday for drier weather.